Finalist in the 2018 Foreword Reviews INDIES Awards in the Self-Help and the Body, Mind & Spirit categories. A Silver Winner in the Personal Growth category of the 2017 Nautilus Book Awards. 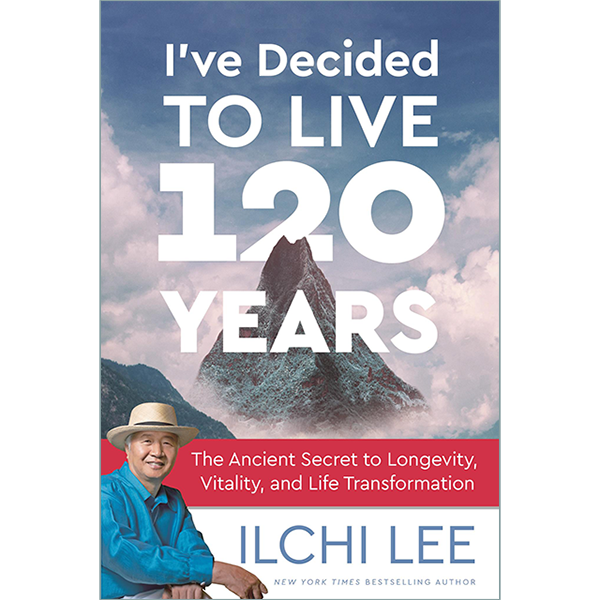 New York Times bestselling author and one of the most renowned meditation teachers in our time, Ilchi Lee challenges you to radically rethink your ideas on aging, health, personal fulfillment, and what’s possible in your lifetime. A visionary and master teacher who globalized ancient Korea’s mind-body tradition, Ilchi Lee lays out a clear path to a new paradigm of longevity and mastery of life. Through personal experience, compelling stories, the wisdom of an ancient Korean holistic practice, and current research on longevity and fulfillment, Lee shows readers how to live fully at any age without regrets. Ilchi Lee shines a bright light of ancient and post modern wisdom on the impact of how each of us defines our life purpose and the pathways we choose for its fulfillment. His book’s genius is not only its scientific, time-tested longevity principles, but also how he infuses it with his own good heart. I’ve Decided to Live 120 Years by Master Ilchi Lee is a vital text for all of us who choose to go the whole way in this lifetime. Lee is a master teacher, who has developed the actual practical processes and methodologies to live an optimum life. Now he takes us to the next step, revealing “The Ancient Secret to Longevity, Vitality, and Life Transformation.” The foundation of this book is found in Sundo, a Korean system of mind-body training with a tradition stretching back thousands of years. It offers us the best road for the second half of our life, from 60 to 120. I am personally choosing to study with Master Lee to “Live 120 Years” to fulfill my own life purpose. At 88, I feel as though I am “getting newer every day!” For all of us who are experiencing the deep inner call to participate fully in the next years of the most radical transformation humanity has ever known, this book is an essential guide. Ilchi has been practicing what he teaches for decades, and I have been fortunate to experience firsthand how his visionary view of the human potential actually translates into reality. I have physically climbed the 120 steps to a meaningful and fulfilled life that he describes in his book, and have incorporated his advice into my own life. If there is one book you don’t want to miss, it is I’ve Decided to Live 120 Years. Ilchi Lee is an impassioned visionary, educator, mentor, and innovator. He has dedicated his life to help people harness their creative power and potential. He has developed many successful mind-body training methods, including Body & Brain Yoga and Brain Education. Lee is a New York Times bestselling author with over 40 books and a well-respected humanitarian who founded the Earth Citizen Movement and works with the United Nations and other organizations for global peace. Lee serves as the president of the University of Brain Education and the International Brain Education Association. Get the audio download at Best Life Media, Amazon, Audible, or iTunes. Or listen to it on audio CD.